Ever since I was a child I have never liked finishing a drink. My mom used to gripe about all the glasses sitting around the house with half an inch of water, juice, or tea that was left at the bottom. I’m not sure she understood what I was saying, but it was true. I never liked the thought of things being done and over with. I didn’t like finishing my favorite books or video games. I wanted the stories to keep going. Don’t even ask me how I took watching the last Harry Potter movie. For some odd reason, that dislike always manifested itself in unfinished drinks. To this day I still refuse to drink that last half inch. I made a delicious gunpowder green tea and sipped on it while writing. I was feeling a bit worn out and I looked tired. My skin definitely hasn’t looked the greatest these last few weeks as I’ve been hustling to get my blog completely updated. I really needed a pick me up. Lo and behold I go to take another sip of tea and notice it’s that last half inch. It’s gone cold and I don’t feel like finishing it, yet something tells me I should find a way to use it up. The tea is, after all, a bit pricey and it would be a shame to let it go to waste. I solved that problem by deciding to use it in a mask recipe. This mask was sooooo refreshing and just what I needed to give my skin that little boost. The best part is the effect is long lasting so it was easy to get over that strange mental block I have over finishing drinks and the drink “ending” so to speak. So this mask isn’t actually green in color, in fact, it’s rather red and if you aren’t careful you might temporarily stain a towel like I did. Oops. At any rate, this mask is super refreshing. 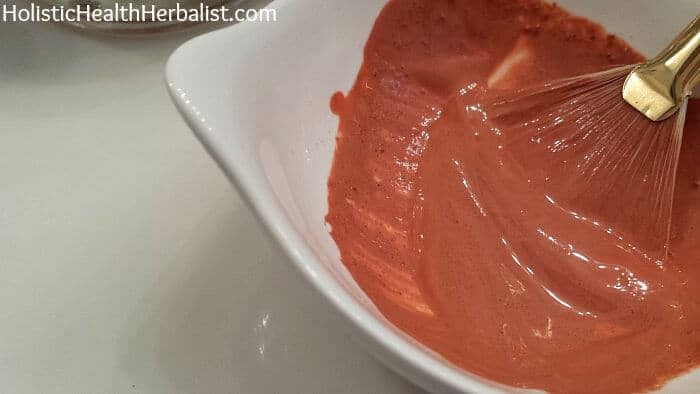 The Moroccan Red Clay pulls impurities from the pores and I prefer it over other clays for acne-prone skin. The tea tree in this recipe kills acne-causing bacteria while also giving the mask a very cleansing feel. It’s almost as if you’re using peppermint essential oil in the recipe but the freshness is lighter. I use a fan brush to mix and apply the mask in even layers. It gives the experience a more spa-esque feel along with allowing you to get every nook, cranny, and pore. I highly recommend you try applying masks this way! [yumprint-recipe id=’86’]Your skin will feel so clean and refreshed! I hope you give this mask a try! Hey great website!! !, if you can please answer this question – if I put left over mask in a jar and use it a week later (this goes for any mask betonite, French etc.) does it still work as well and is thier any way to better preserve the consistancy and minerals? Thank you so much and God bless you amazing website! !